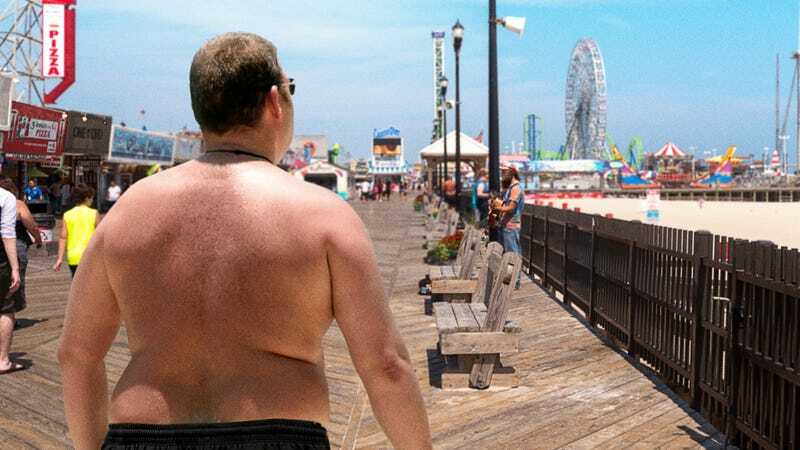 Get ready to be amazed, because there’s an incredible natural event taking place right now that’s sure to take your breath away: America’s heavyset, sunburned men wearing basketball shorts as bathing suits have begun their annual migration to the Jersey Shore’s boardwalk punching bag arcade games. So beautiful. Nothing says spring has officially sprung quite like this amazing phenomenon! Each year as the weather on the East coast of the United States warms up, thousands of husky, wife beater-clad men with roasted-red shoulders awaken refreshed and eager to begin yet another journey to the Jersey Shore and its bounty of arcade games. After spending the cold winter months pent up inside their ranch-style houses in the suburbs of Philadelphia and New York, staying busy by trimming their graying goatees and rubbing lotion on the new Celtic cross tattoos on their outer calves, these incredible specimens are able to sense when it’s time to put on their long Nike basketball shorts with checkered Hanes boxers peeking out above the waistband and begin their migratory journeys. Ecologists say they typically grab Hulk Hogan-style reflective sunglasses out from the center consoles of their cars before beginning their trek toward the Jersey Shore boardwalk’s boxing-themed game consoles, where they will at last get the chance to punch a dangling speed bag and have their striking power rated with scores between 500 and 1,000. Fascinating. Nature truly is full of endless wonders! Absolutely amazing. This phenomenon is truly be a sight to behold, and we bet that anyone who gets a chance to witness it this year will not be disappointed. Here’s hoping that these beautiful, sun-kissed men have a safe journey and a successful nesting season!